A literately overflow crowd was on hand for the opening of Matt Cartwright's W-B office in W-B tonight. So many people showed up that there wasn't enough room in the building to hear him speak and those who couldn't get in spilled out onto the sidewalk. I was a afraid the fire marshal would arrive but Mayor Tony George was there so that didn't happen. Matt Cartwright (D-Moosic) started off by asking a moment of silence for John McCain. He then assured us that there are members on both sides of the aisle who want to do the right thing for our country and tries to work with them everyday. He's proud that many of the bills he has introduced have Republican co-sponsors. He gave a full throttled defense of Social Security and Medicare and trashed the latest trickle down tax cut bill. He reminded the crowd that the full name of Obamacare is The Patient Protection and Affordable Care Act. The protection part is making sure that people with pre-existing conditions can get coverage. A big chunk of the population has some sort of medical condition that used to allow insurers to deny them coverage. He decried the provisions of the last tax bill that gave away the store to corporations and the very rich with few benefits for the rest of us. Part of it was repealing the the individual mandate that cuts funding for the program and reduces the risk pool so premiums will soar. . Governor Tom Wolf was the headliner for the Luzerne County Democratic Party event tonight and he didn't disappoint. The place was so packed that I couldn't get a count. More than 300 people , maybe more packed the ballroom. He listed his accomplishments like getting more people health insurance, balancing the budget with enough money to make a deposit to the rainy day fund. Wolf pointed out that he was able to restore funding for education working with a Republican Legislature. He didn't mention his opponent once. The local Democratic candidates also attended. 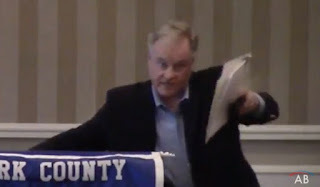 State Senator John Yudichak was the MC with some good jokes. Congressman Matt Cartwright fired up the crowd and I was lucky not to get between Eddie Day and the microphone, a dangerous place. Jerry Mullery also spoke. A special treat was seeing Cassandra Coleman. She convinced me to vote for Wolf last time. Yes, the party that holds the White House historically loses seats in the mid term elections. We all know that a record number of women are running for office and winning primaries for Governor, Congress and State offices in record numbers. But the thing I'm seeing is the intensity of their supporters beginning with the Women's March in January of 2017 that has not abated. All the evidence points to a big year for the Dems with bigger than normal turnouts in primary and special elections but very few Democrats have actually won special elections for Congress unless the GOP candidate is just ridiculous like Roy Moore or Rick Saccone. On the state level they have done much better. I'm always cautious about expectations because the Republicans have some advantages. First is almost unlimited money. Millionaires and Billionaires can write checks to dark money groups because of Citizens United that go to so called social welfare groups. They then can spend that money painting Democrats as the equivilant of devil worshipers who want to take you guns, murder babies and give people health insurance. The second is gerrymandering. Things have improved in PA but many states have carved up the districts to give the GOP a big advantage. Just look at Ohio 12. In a fairly drawn district the Democrat would have won easily. So that leads us to our little corner of the world. The Democrats are playing defense with Governor Wolf, Senator Bob Casey, Congressman Matt Cartwright and State Rep Eddie Day Pashinski on the ballot. Their opponents have gone all in with Trump. Although we don't have women running for office the Democratic women are leading the charge to keep these men in office. After many years of being dormant the Luzerne County Democratic Party is coming roaring back. We are being led by Polly Delaney and Wendy Cominsky. This dynamic duo have organized many events past and future and are looking for ideas from the rest of us to just get people to vote. Senator Bob Casey gave one on the most passionate speeches on health care that I have ever heard. He threw out out a lot of statistics about how the ACA has covered thousands of people in Luzerne County. Then he gave examples of people who have benefited from the law. I know it's hard to keep up with all the news out of the 3 ring circus going on in Washington. It's like trying to take a drink out of a fire hose, you may get your lips wet but if you try to swallow it all your head will get blown off. Now the EPA want's to relax the rules and bring back Asbestos. This is after 40 years and billions of dollars trying to get rid of the stuff that is scientifically proven to cause cancer just by breathing it. I really can't blame the part-time occupant of the White House for this because he has no idea what is going on in his own administration. 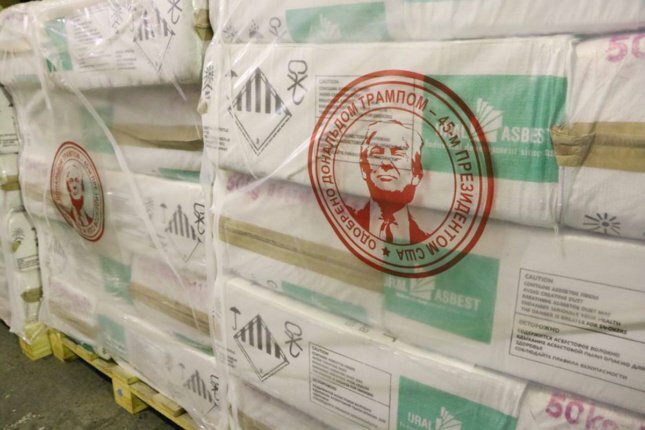 The Russian company Uralasbest, one of the world’s largest producers and sellers of asbestos, has taken to adorning pallets of its product with a seal of Trump’s face.